Chevrolet took the wraps off one of (presumably) many concept designs it will bring to the 2016 SEMA Show in Las Vegas. The 2017 Chevrolet Silverado 2500 HD Carhartt concept partners with the long-running work-clothing brand to provide a conglomeration of tough, hardworking ideals. As usual, we’re here to ask if the concept is a looker or a loser in today’s Hot or Not. Outside, things are pretty low key, with gold pinstriping running across both sides of the truck, accented by the Carhartt logo below. The tonneau cover is also made with Carhartt fabric. Antique nickel accents help break up the rest of the design, providing splashes across the front grille, 20-inch wheels mirror caps and tow rings. Chevrolet has not yet shown us official photos of the Silverado Carhartt’s interior, but we know the iconic duck brown garment material is found on the seats, armrests and door panel inserts. Each portion also features triple-stitched seams just like the jackets. 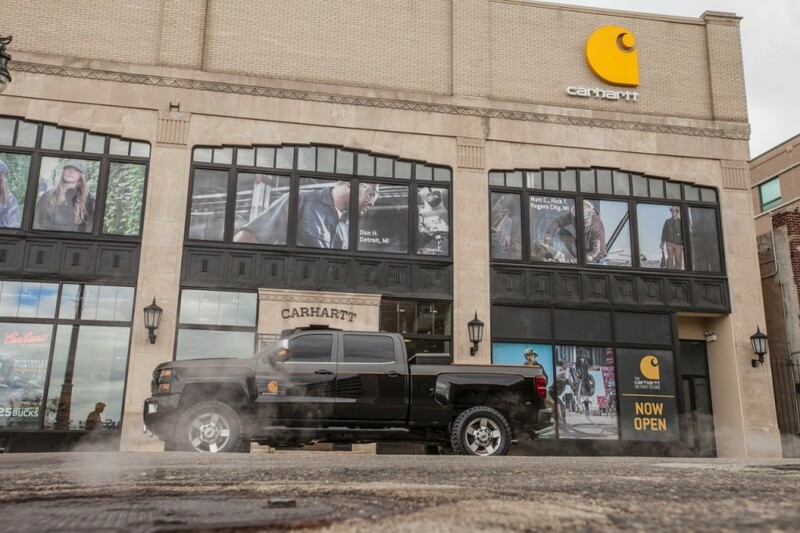 We think, overall, the Silverado Carhartt concept is a handsome looking truck. It’s certainly not in your face like last year’s Silverado Kid Rock concept, but we can appreciate the subtlety in a well-executed truck. But, this is SEMA, after all. The Carhartt concept could easily get lost in the crowd. Well, I like the truck and would like to see what the interior looks like since I’m not a fan of the brown duck but black duck material, like my pants and jacket, all the way around would be of interest. What concerns me is what the price tag will be and whether I really feel like paying more to be a rolling advertisement for Carhartt. Seems to me the price should be lower for being their rolling ad, IMHO. I think it is pretty sharp. It has a nice lift, aggressive tires and some other nice tid-bits. The potentially high price tag may shock customers though. Would it be available in white ?